BTW, I LOVE soup! 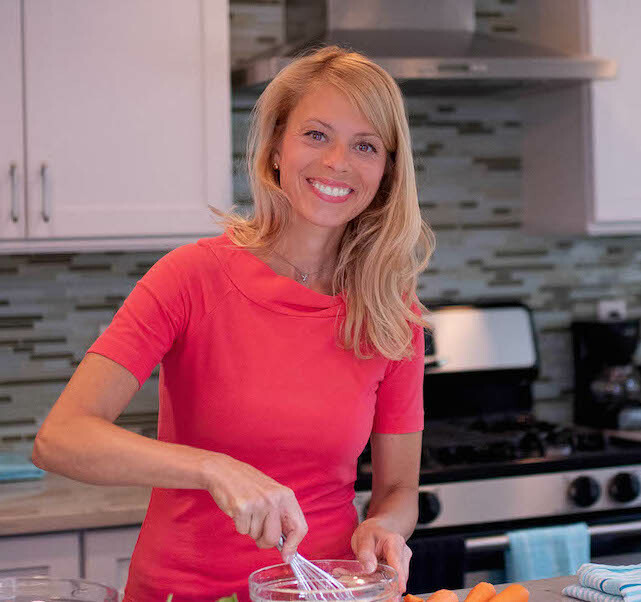 Here are some of my other favorite easy soup recipes! Just a little kick, not sweat-inducing heat – I promise! You might be saying to yourself, ‘what?! jalapeños with my peas? ?’ But the amount in this recipe is not overwhelming, it will just give you this wonderful secondary warmth in the back of your mouth, not an initial spicy hot kick to the tongue. 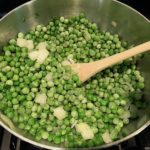 You still get the freshness and spring flavor of the peas to start, but then you get that slight spice and warmth that makes you want to go back for more. 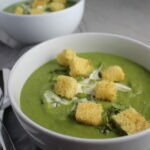 The jalapeños are really what perk up and breathe new life into this Pea Soup recipe. 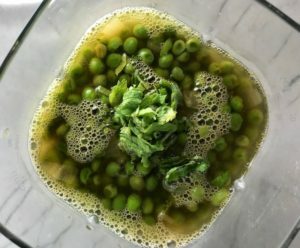 With this combination you get the sweet spring flavor of the peas with the cool fresh mint, followed by the peppery kick from the jalapeño that leaves a wonderful warmth (not spicy-hot) feel in your mouth. 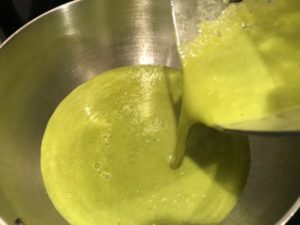 Its the ultimate combo of sweet, cool, and hot all blended together for the perfect Zesty Pea Soup. 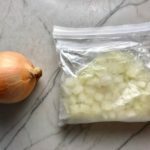 You can buy frozen onions, but I like to make my own, because it’s cheaper and so easy. Simply dice the onion the day before and place it in a freezer bag in the freezer over night. 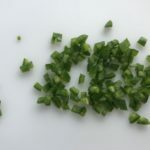 The only other thing that could be prepped in advance is to finely dice the jalapeño. 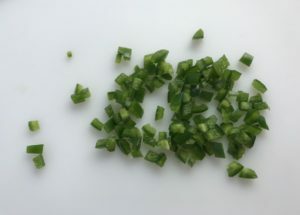 You need 2 tablespoons, which I find is about 1 fat 3-inch jalapeño. 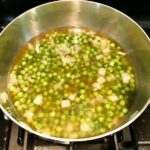 In a medium sauce pan, add a teaspoon of olive oil, then add the frozen peas, frozen onion, and fresh jalapeño. 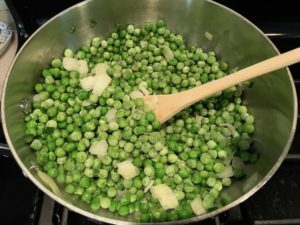 Cook for 8-10 minutes, until the peas and onions are thawed, stirring frequently. 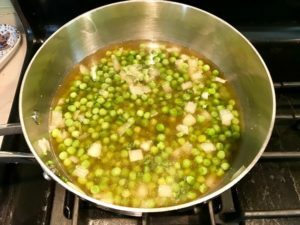 Warm the vegetable broth up in a sauce pan (it does not need to be brought to a boil, just warmed) and then add it to the peas. Cover and simmer for 10 minutes. After cooling a bit, comes the blending! 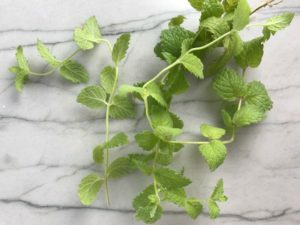 This is when you will add in the fresh mint. You can blend to your heart’s desire, so taste as you go to see if you like some texture or want it more smooth. 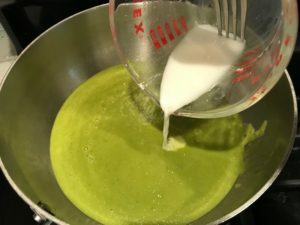 If you need to do this in batches because it is too much liquid, that’s fine too, just make sure you blend the same ratio of peas to broth so you get the smooth consistency you want each time. 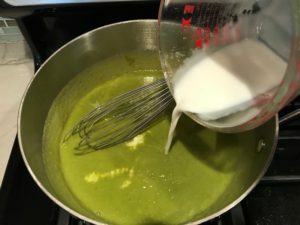 After you blend to the perfect texture and consistency, you will pour the soup back into the sauce pan, then whisk in the Half and Half as well as the corn starch slurry. Bring back to a simmer (do not boil) and cook for 5 minutes stirring to make sure no clumps form as the sauce thickens. Taste for seasoning and add Salt and Fresh Ground Pepper to taste. 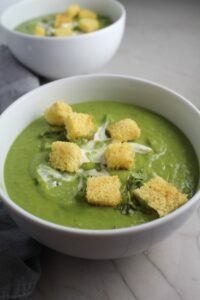 Serve in bowls and garnish with fresh mint and other toppings you love, such as croutons or sour cream. 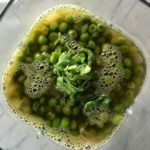 Creamy, sweet, fresh, with a kick...this Zesty Pea Soup with Peas, Jalapeño, and Mint is a delicious new take on the traditional Pea Soup recipe! 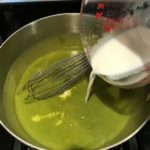 You get the sweet spring flavor of the peas with the cool fresh mint, followed by the peppery kick from the jalapeño that gives you a wonderful warmth (not spicy hot) feel in your mouth and keeps you coming back for more. 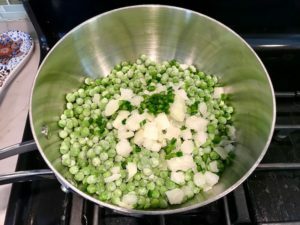 They blend together for the perfect Zesty Pea Soup. 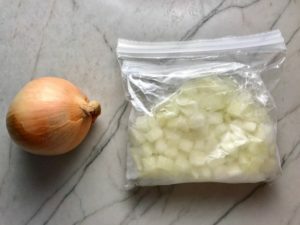 Dice the onion and place the onion in a bag in the freezer over night. Seed the jalapeño, then dice it. Move the soup pot off the hot burner and let it cool for about 10 minutes. Then, transfer the soup to a blender and add the mint. Blend until completely smooth. 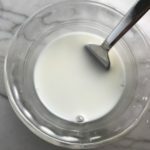 Make the slurry by adding the corn starch to the cold water. Pour back into the sauce pan, and whisk in the Half and Half as well as the corn starch slurry. Bring back to a simmer (do not boil) and cook for 5 minutes stirring to make sure no clumps form. The sauce will thicken a bit. Serve in bowls and garnish with sour cream or plan yogurt and fresh mint. 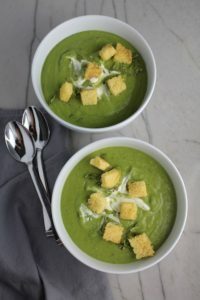 Pea Soup is one of my all time favorites. It reminds me of my mom as she would make it every Fall. 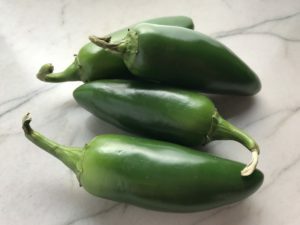 And what a great idea to heat it up a bit with jalapeños. 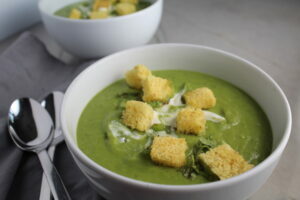 The flavors you’ve brought into your pea soup sound fabulous. I can’t wait to try it for myself. Thanks for posting!